What Do You Do When a Fire Engine Interrupts You? Take a pic! Monday 16th November was quite a significant day for me. I delivered what will probably be my last *face to face licensing event for the five RenewYou specialists above. I wanted it to be a special day and it was, in more ways than one. First of all I woke up with half a voice. I had developed a croaky throat overnight, not good for someone who does public speaking as often as I do. Tea was poured down my throat in vast quantities until some semblance of a voice returned. Secondly, the hotel was nearing the end of a major refurbishment and hadn’t yet put names on the doors of its conference rooms. It also had a lot of building work happening which made finding your way around tricky. Yes, I got lost…more than once. When I located our room I put my huge banner up outside in the hope that my specialists would be able to find it more easily. They did, although I did manage to not know my left from my right when giving instructions to my husband to deliver the materials and journals… Honestly, you think after 40 years with me he’d know I’m directionally challenged. (Sorry, Alastair). Our next unscheduled event was the fire alarm going off for the minute silence for victims of terrorism. That was no problem and we resumed. However, about 30 minutes later it went off again and this time it didn’t stop. Fortunately, I had done the obligatory ‘this is what you do in event of a fire’ talk (I am wife of retired fire-fighter – I never leave that out!) so we duly left and assembled outside the hotel. There is something about the arrival of a fire engine that seems to reduce sane women (and some men) to a laughing heap. We were no exception. 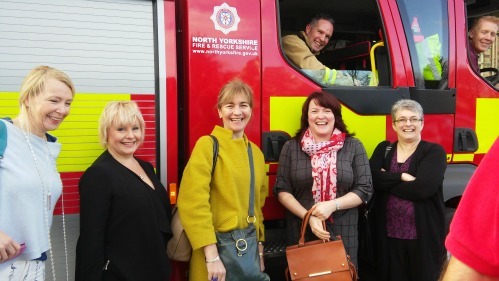 The North Yorkshire Fire & Rescue Service were very obliging, hence our rather unusual picture of the latest wonderful women to join RenewYou. Welcome Caroline, Rachael, Shelly, Kate & Maureen. It’s great to have you with us. You can find more information about them and details of all the RenewYou courses on offer across the UK and beyond by clicking this link. This is not the first time I’ve mentioned fire-fighters in this blog. Check this one out Who is your hero? *We are still licensing wonderful women to spread the RenewYou word, we’ve just found a better, more accessible way of doing it.